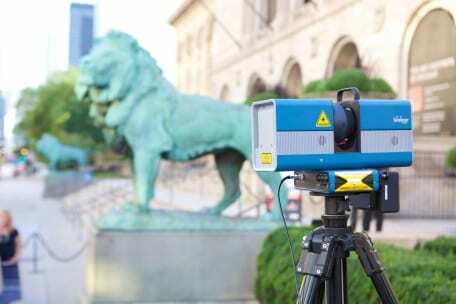 On September 16, 2015, for approximately three hours, Exact Metrology technicians performed a 3D scan of the huge South Lion that guards the entrance to the world-famous Chicago Art Institute. The subsequent STL file is being used by Chicago-based Met-L-Flo to generate 300 3D printed miniature lions, to be displayed and provided to visitors at the upcoming FABTECH show in Chicago, November 9-12. Using their Surphaser and ARTEC scanners, Exact technicians built a 3D image, which was displayed on a huge monitor for passersby to see. 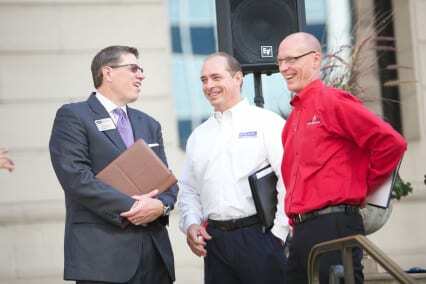 As part of this event, which was sponsored by FABTECH show management, FMA president and CEO Ed Youdell introduced Exact president Dean Solberg and Met-L-Flo president Carl Dekker, who both detailed the work their companies were doing to complete this unique and interesting project. The South Lion, named Attitude of Defiance, was originally sculpted by Edward Kemeys for the 1893 Columbian Exposition in Chicago and stood on the steps of the Fine Arts Palace, which is today the Chicago Museum of Science & Industry. Later that year, the lion and his “brother”, named On The Prowl, were recast in bronze and moved to the steps of the new Art Institute, where they’ve guarded the entrance to this day. As Dean Solberg remarked, “We’re creating a file with millions of 3D data points that would allow the program to accurately recreate the lion at almost any size, whether on a conventional CNC machine tool or in the new 3D printing method being used by Carl (Dekker) and his team at Met-L-Flo. Dekker noted that 3D printing of one of the seven additive manufacturing techniques his company currently employs to make not only prototypes but also functional short run production parts. Local media and trade press were on hand at the event, which garnered TV coverage that evening in Chicago. Exact Metrology will be exhibiting its various metrology equipment and services, including robotic articulation and its new CT scanning technology that allows precision examination of internal structures, during FABTECH. WHAT: FABTECH 2015, North America’s largest collaboration of technology, equipment and knowledge in the metal forming, fabricating, welding and finishing industry, will bring 3D scanning technology to the steps of the Art Institute of Chicago on Sept. 16. Exact Metrology, a 3D scanning solutions company, will use its Surphaser technology – known for its high accuracy and scan data quality – to 3D scan the museum’s south lion by Edward L. Kemeys (1843-1907). The guardian lions have flanked the Art Institute’s iconic Michigan Avenue entrance for more than 100 years and have become a symbol of the museum and of the city. Attendees will have the opportunity to witness Exact Metrology’s scanning technology firsthand and hear from industry leaders as they discuss the process and benefits of 3D scanning and printing. Additionally, speakers will provide a look at what other advanced manufacturing technology will be showcased at FABTECH 2015, taking place at Chicago’s McCormick Place, Nov. 9-12. After the scan data is captured, Met-L-Flo will use it to print approximately 300 small-scale replicas of the lion, which will be on display and used as giveaways at FABTECH. Following the brief press conference, representatives from FABTECH, the Art Institute, Exact Metrology and Met-L-Flo, Inc., will be available for interviews. Carl Dekker, president, Met-L-Flo, Inc. Note: Press conference to take place on steps near the south lion, located in front of the Art Institute. Exact Metrology is an ISO 9001: 2008 certified company that offers contract measurement & scanning services, metrology equipment solutions, and hardware & software rentals. 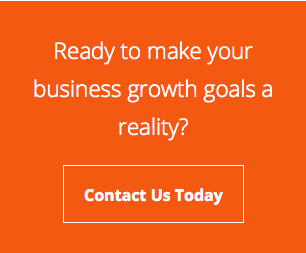 Its goal is to provide customers with a specifically tailored solution to their measuring needs. To accomplish this, it offers more options, more products and more experience. FABTECH is North America’s largest collaboration of technology, equipment and knowledge in the metal forming, fabricating, welding and finishing industry. The event provides a powerfully aligned hands-on, face-to-face business growth experience, attracting more than 1,500 exhibitors and 40,000 attendees. The event is made possible by its five co-sponsors, all of whom representing the varied and diverse makeup of the manufacturing industry. They include SME, the American Welding Society (AWS), the Fabricators & Manufacturers Association, International (FMA), the Precision Metalforming Association (PMA), and the Chemical Coaters Association International (CCAI). Read more about FABTECH’s co-sponsors here. The Art Institute of Chicago collects, preserves and interprets works of art of the highest quality, representing the world’s diverse artistic traditions, for the inspiration and education of the public and in accordance with our profession’s highest ethical standards and practices. Met-L-Flo, Inc., is a contract manufacturer specializing in 3D Printing and Additive Manufacturing services since 1991. It strives to partner with clients to implement innovative solutions for their product development and low volume production needs. Advanced applications of its technologies enable it to boost clients’ competitiveness and enhance product success. Its commitment to Quality is solidified in the company’s ITAR, ISO 9000 and AS 9100 Rev C Certifications. Josh Schradin, one of the 3D Scanning specialists at Exact Metrology’s Cincinnati facility, recently completed a CT Scanning project involving aluminum castings measuring approximately 12” x 6” x 6” and weighing 10 to 15 pounds. 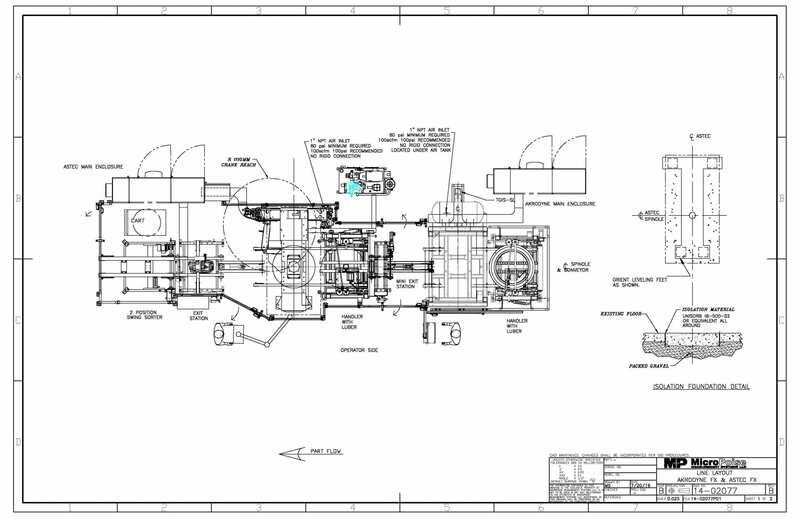 The company’s new Metrology Grade GE v|tome|x 300 CT Scanner, with Nanofocus Tube (180kV/15 W) and Microfocus Tube (300kV/500W), is equipped to “look inside” aluminum to a wall thickness or total amount of material of six to seven inches, or steel to a wall thickness or total amount of material of one inch. 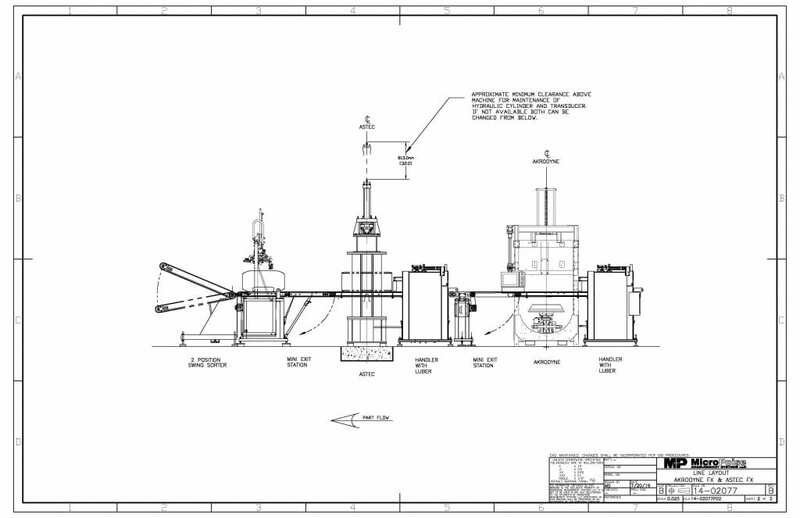 For this particular job, which represents the first use of CT scanning for metrology in America, the client was interested in wall thickness inspection as well as porosity and void analysis. 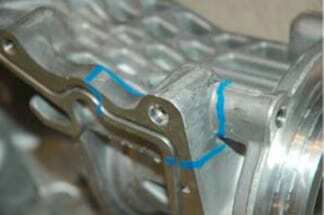 The blue paint visible in some of the images was applied by the customer to indicate stress areas where leaking or breaking was suspected. Josh Schradin performed three stacked scans, each taking only about 30 minutes, to capture the entire casting. 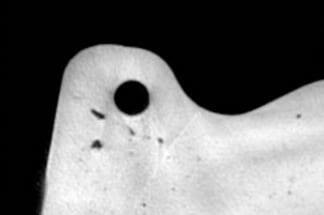 The result of the scans revealed the voids (legitimate holes) and highlighted the most serious problem areas in red-to-pink shadings. 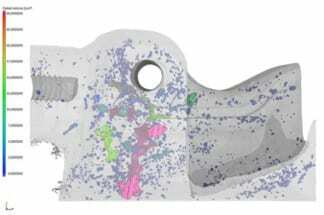 In addition to offering the only method to get 3D views inside a part, another primary benefit of the Exact Metrology CT scanning is the true dimensional data provided in a non-destructive test manner, i.e. without cutting up or otherwise destroying the test object. The workpiece (casting) was rotated 360 degrees in the x-ray beam’s path, with multiple readings from various angles being taken. Once the CT grey scale images were converted into voxel-based 3D point clouds, Schradin was able to generate a CAD-to-Part comparison for the customer. If interested parties have a need for Internal Defect Analysis/3D Quantitative Porosity Analysis, Materials Structure Analysis or Assembly Control, CT Scanning (Industrial X-ray), Exact Metrology invites inquiries for immediate assistance. 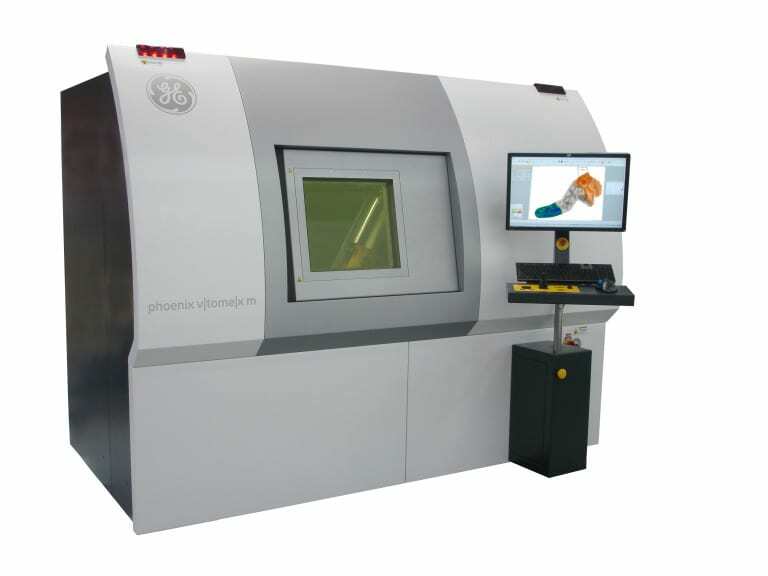 Exact Metrology, based in Cincinnati, Ohio, has acquired a new Metrology Grade GE Phoenix v|tome|x m, a CT scanner system with dual tube technology, nanofocus to 180Kv and microfocus to 240Kv, significantly expanding the company’s capability in 3D scanning to 2 microns with sufficient power to measure denser parts. Exact Metrology is the first company in the U.S. to purchase this system, according to company sources. Exact President Steve Young notes, “We bought the new system because it has significantly greater accuracy, better detail and great reliability. Exact is currently seeking users for this new system.” The system has already received operational approval from the state of Ohio and is installed at the company’s main facility in Cincinnati. The Phoenix v|tome|x m system features a unique temperature stabilized detector array (up to 30fps) for extremely fast CT data acquisition on workpieces up to 500 mm diameter and 600 mm in height, weighing up to 50 kg (110 lbs). 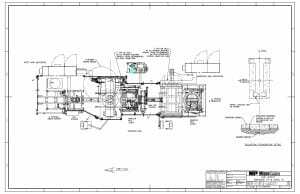 Typical functions performed on this system might include 3D analysis of a scanned turbine blade, automatic pour porosity volume analysis on an aluminum casting and 3D measurements with nominal-actual CAD comparisons on a machined aluminum cylinder head. Exact Metrology is offering this service for process control and customer R&D functionality, plus scientific research applications. With full CT automation, click & measure capability and the dual tube technology, this new system can perform analyses on an extremely wide range of samples, from high-resolution nano CT of low-absorbing samples to the high-power micro CT applications such as engine turbine blades. 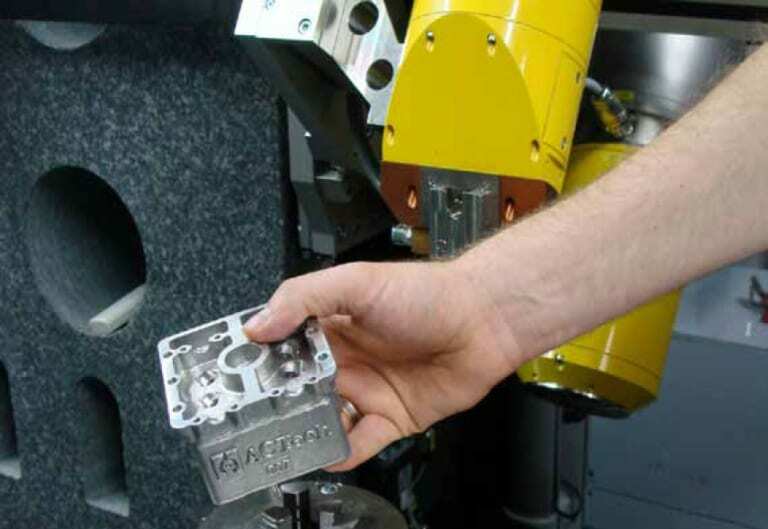 Other applications for possible utilization of this new system at the Exact Metrology facility include light metal castings, electronic assemblies, thermoplastic molded and composite parts, plus all types of machined metals. Compared to conventional tactile or optical CMMs, this new scanner system can generate a first article inspection report including internal dimensions in less than one hour, with high accuracy and repeatability. Utilizing the GE Phoenix Datos|X CT and Volume Graphics software platform further enables full automation of the system at Exact Metrology, thereby reducing the time to perform the testing procedures.